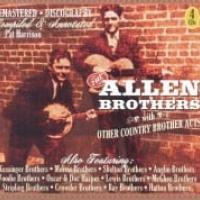 “Possibly the prettiest country music ever performed” and “Quite likely the finest harmonising duo ever recorded”. That's what two commentators thought of Bill and Earl Bolick – The Blue Sky Boys. Bill and Earl’s forbears were Germans who originally settled in Pennsylvania, and later moved to the Piedmont region of North Carolina - an area that produced many fine country and blues artists. The brothers first recorded in 1936 until 1940 when they were both drafted into distinguished war service (Earl was awarded the Purple Heart and the Silver Star). They successfully recorded again from 1946 to 1950, when they decided to retire from music to raise their families. During those two relatively short periods of recording they became one of the most popular and influencial country duos, up there with The Monroe Brothers, The Callahan Brothers and The Delmore Brothers. This 5CD, 121 track set features all of their important recordings from the two periods. A typically excellent budget-line reissue from the box set specialists at JSP, The Blue Sky Boys is a 121-track set on four discs for anyone who values the music itself over fancy packaging or extensive liner notes. Bill and Earl Bolick were part of the second wave of country music stars, the groups who appeared in the mid-'30s as the country was struggling to right itself under the weight of the depression. From 1936 to 1950, the Bolicks were one of country's most beloved acts, with their strictly acoustic sound and devotion to gospel tunes. 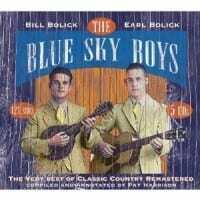 All of the Blue Sky Boys' key records from this 14-year period are included here, including hits like "Kentucky" and "The Sunny Side of Life," alongside fan favorites "I'm Just Here to Get My Baby out of Jail" and their take on the Elizabethan murder ballad "The Butcher's Boy." So deeply earnest that they would seem ripe for mockery by modern alt-country hipsters -- see "I Love Her More Now Mother's Old" and "I'm Going to Write to Heaven (For I Know My Daddy's There)" -- the Blue Sky Boys are so angelic of voice that it's impossible for even the most churlish to giggle at this blend of country and traditional gospel.